Starting today, Ford Motor Company is taking a different approach to hiring for some positions. In a collaboration with the Autism Alliance of Michigan, the automobile manufacturer launched a pilot program that aims to provide individuals who have autism on-the-job work experience and training. FordInclusiveWorks, the name of the pilot program, is being funded by the Autism Alliance. Five new positions in product development were created to suit the skills and capabilities of people with autism. As part of this pilot, Ford will evaluate participants for future employment, as well as the program in general. If there is a potential fit, the person will enter into Ford’s standard recruiting process. Read more about the program and learn how to apply on Ford’s website. This hearing, scheduled for 10 a.m. Thursday, will focus on small businesses that provide employment opportunities for adults with intellectual or developmental disabilities, including Terri Hogan, owner of Contemporary Cabinetry East in Cincinnati. It will be streamed live on the Committee’s website. In addition, Hogan, the Committee will hear from Joe Steffy, owner of Poppin Joe’s Gourmet Kettle Korn in Louisburg, Kansas, Lisa Goring of Autism Speaks, and Rajesh Anandan of ULTRA Testing in New York. Last year on this blog, we told you about Microsoft’s plans to recruit candidates with autism for jobs at the software giant. Now, a full year after the company announced its plans, the hiring program has been a resounding success. Microsoft received hundreds of résumés from people with autism including many who had advanced degrees but were working in retail or other similar jobs. “We want to help make this a more inclusive, a more accessible environment and company, where you can bring it and you can deliver great things and show your strengths and be who you are every day. Just come to work and be who you are,” said Jenny Lay-Flurrie, the company’s Chief Accessibility Officer. Part of opening Microsoft’s doors to employees with autism required changing the interview process. In the final stage, applicants are on campus for two weeks, allowing more time to relax and show their skills. Read more about the program and meet some of the new hires in this story from a local Seattle news station. Even on a crisp, winter day in Sanger, Texas, all Blake Pyron wants to talk about are his snow cones. “Banana, green, root beer,” he says, listing off flavors. The icy, sweet treats may simply be symbols of summer to you and me. But they mean so very much more to the 19-year-old with Down syndrome. “We have high expectations for Blake,” said his mother, Mary Ann. Mary Ann Pyron says her son is about to become the youngest business owner in Sanger, and possibly the only business owner in Texas with Down syndrome. She says city council will give final approval on Feb. 1 for him to open Blake’s Snow Shack. It will be a stark contrast to the news doctors delivered to the family that very same day 20 years ago, when Blake was born. Blake is officially the president of the company. His parents are co-owners. And 15-year-old neighbor Tanner Maples is his employee. “Whatever he needs, I’ll help him with,” Maples said. Is Ohio a model for community employment? Minnesota is looking toward Ohio when it comes to community-based jobs for people with developmental disabilities. The state recently began a voluntary initiative known as “Way to Work,” which focuses on talking to adults with disabilities about their ambitions and the possibility of working in the community. Minnesota’s program is based on Ohio’s “Employment First,” which puts employment as the preferred outcome for all working-age adults. In recent weeks, state and county workforce officials have quietly introduced an ambitious new project — modeled after a highly successful program in Ohio — to give people with disabilities an alternative to working in “sheltered workshops,” cloistered workplaces that pay as little as $2 an hour for mundane jobs such as packing boxes, shredding paper and collecting trash. The program tests the assumption that people with developmental disabilities prefer the safety and routine of segregated workshops to better-paying jobs in the competitive workplace. If broadened statewide, the program could mark a fundamental shift in Minnesota, giving those who yearn for integrated employment far more control over their lives and career choices. The voluntary initiative, known as “Way to Work,” is driven by a simple concept: That people with disabilities are more likely to find jobs in the general workforce if trained counselors talk to them openly and regularly about their ambitions. In just six weeks, one in three people who labor at an Eagan workshop operated by ProAct Inc., one of the state’s largest workshop operators, have indicated they want jobs in the regular workforce for competitive pay. They are now working with state and county social workers to make that dream a reality. Read the whole story in the Minnesota Star Tribune. A first-of-its-kind, fully functioning teaching hotel designed to provide job training and employment for people with disabilities is now open, according to Disability Scoop. At least a fifth of the employees at a Courtyard by Marriott hotel in Muncie, Ind. will be people with disabilities. At least 20 percent of the staff at the Courtyard Muncie at Horizon Convention Center are people with developmental and other types of disabilities, according to Sally Morris with The Arc of Indiana, which spearheaded the project. Individuals with disabilities are already employed in all areas of the operation including at the front desk, in housekeeping and at the on-site bistro and restaurant. The hotel in Muncie, Ind. opened Dec. 22. 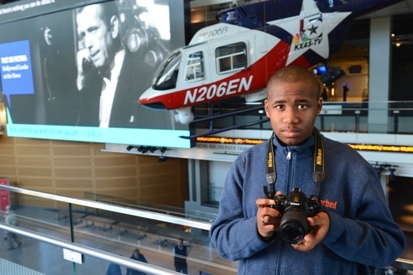 Brian’s passion for photography began three years ago when he was in the sixth grade. He had always been fascinated by people with cameras. In fact, it was the only time he would leave his mom’s side, she says as she watches her son pose, now the subject of a photographer. For the last few years, he has been very active in not only pursuing, but manifesting his innate passion for photography. This interest in photography has made Brian a young entrepreneur. He has compiled his original photographs into two calendars, which he sells online. His calendars capture images of nature, outdoors scenes and zoo animals – the lions are his favorite – and the profits have allowed him to buy some of the seven cameras he owns. Brian has many ambitions about his photography. His mom thinks he could open a camera store some day because he knows so much about cameras. You can read the rest of Brian’s story and the other profiles on Disability.gov.